Materials and directions are for ONE book end. something heavy (rocks work perfectly and are fun to collect outside, but you can also use dried beans, dried rice or sand). Colored macaroni (click here for directions on how to make). paper mache paste (click here for directions on how to make). Prepare your paper mache paste right away so it has time to cool (if using the boil method). I like boiled paste as it's smoother and takes a lot less flour (the REDUCE part of the three R's!). 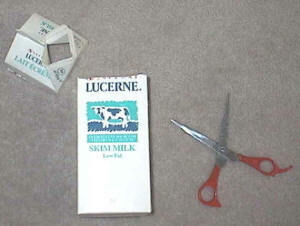 Cut the top off the milk carton. This may require adult assistance. Measure the bottom of the carton (it should be about 5 inches). Measure up the same height on the milk carton and make a mark. Cut down from the top until you reach the mark you made. Fill the box with something heavy (we used rocks and had lots of fun collecting them). Refold the edges and tape TIGHTLY. (you may notice we are always using this odd green masking tape in our crafts... er, you don't have to use green -- you can use the regular color). Tear strips of newspaper about 1 " wide and as long as you want. Dip in the paper mache paste, but then remove excess paste (I run it through my fingers to do this). Cover the milk carton cube, in no more than 4 layers of paper mache (I always tell the kids no more than 2 as they always put on too much *grin*). If you put on more than 4 it will likely mold before it dries depending on your climate. Let dry COMPLETELY. It goes faster in a warm breezy place. If it's a nice day, just stick it outside (just don't forget it if it starts to rain). It takes a day or so to dry. Optional: apply a second layer of mache. The more layers you add, the sturdier it will be. We applied a second layer, but we only did one layer, not 4 this time. we always use scrap white computer paper or toilet paper (don't laugh *grin*) for the final layer of all of our paper mache projects. It takes less paint to cover. I find newspaper needs two coats of paint, whereas the white paper only needs one. Toilet paper gives a rough texture which is nice for some projects. We used computer paper for our bookends. After varnishing, cut out photo of child to the same size (or a bit smaller) than your cube. Glue onto the front of the cube. 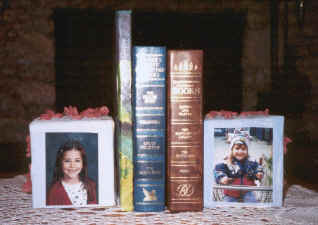 We made these bookends for Grandma Doris (one with each daughter) and they're still proudly displayed in her home. It would also make a nice Mother's Day or Father's Day gift.